Traditional pipeline repair is often associated with piles of rubble, dug up roads and sidewalks, unpleasant smells, and excess waste. Luckily, modern trenchless pipe repair methods get the job done with no destruction. Trenchless repair methods offer an easier, cheaper, and faster way to get pipelines up and running again. Here are some of the major forms of trenchless pipe repair. One of the oldest trenchless repair methods is slip lining. The method involves slipping a small diameter pipe into a larger, damaged pipeline. This reinforces and strengthens the old pipeline without having to dig massive trenches. While slip lining is still used to fix some pipelines, this method has largely been replaced by cured-in-place pipeline repair. 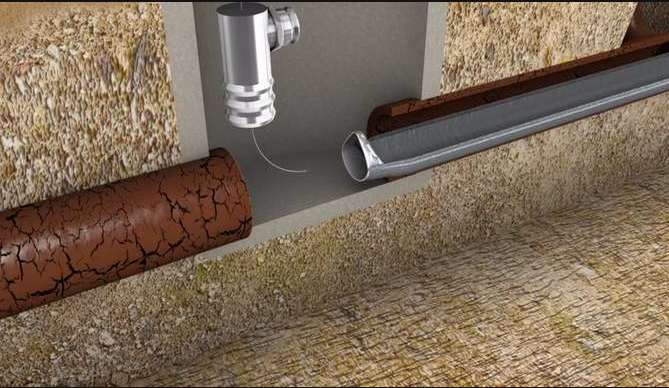 Cured-in-place pipe repair, or CIPP, is one of the most common methods of trenchless pipe repair. Instead of putting a new pipe inside the damaged old pipe, CIPP utilizes a liner. Applying a liner allows for the pipe to maintain its current flow rate. This method of pipe repair is utilized on structurally unsound and leaking pipes in order to repair them without having to actually remove the old pipeline. Pipe bursting is a method used to replace pipelines without having to remove the old one. This process involves fragmented the old pipe in order to install a new one. It's done by pushing a bursting head through the damaged existing pipeline. As the bursting head progresses through the pipe, it pushes the shattered pieces into the surrounding soil. This creates space for a new pipeline to be installed without having to dig. With more and more people choosing trenchless pipe repair, it's important to know the major methods. In order for a repair method to be considered trenchless, it has to fix pipelines without digging into the ground or walls. Three of the major forms of trenchless pipe repair include slip lining, cured-in-place, and pipe bursting. Each of these methods provides its own benefits when it comes to trenchless pipe repair. Next time your pipelines need to be repaired or replaced, contact the professionals to find the right trenchless pipe repair method for you. Thinking of Using a Plumbing Franchise? Read This First! Are you considering switching over to a plumbing franchise’s services when replacing your broken pipes? You'll want to weigh the pros and cons before making that choice. It could cost you significantly more to repair your pipes in the traditional way than when you use CIPP (Cured-In-Place Pipes). The benefits of CIPP repair far outweigh the results of traditional repair methods. A cured in place pipe consists of a tube made of a durable fiberglass or resin cloth that is pulled into the damaged pipeline. CIPP repair can be done from a normal access point like a manhole cover, which is what makes it far more advantageous than normal pipe repair methods. The inversion or pulling of this liner is done using pressurized water or air. Once the tube is in place, hot elements or even UV light work to “cure” the cloth, making it fit tightly to the damaged pipe, creating a joint-less, rust-resistant pipe that works just as efficiently as the original. When your pipes lie under a road or pathway, trenching can lead to many other issues. You have to divert traffic around the dig site while working on the pipes. You also need to store the equipment for days while keeping it accessible. After the work is complete, you’re responsible for restoring the site to its original state. All of this will cost money, which means a greater investment is needed for damage caused outside the actual pipe repair. CIPP is far cheaper because it is fast, efficient, and non-destructive. According to the conventional method of replacing your pipes, trenches are dug all the way down the length of the pipeline. This can cut through other people’s property, farms, roadways, and more. This can lead to disrupted traffic, lives, livelihoods, and worse! With trenchless plumbing, however, these digs will never have to be a reality. It is more environmentally friendly because it doesn’t harm the land. Any repairs and installations can be carried out with as low a disruption factor as possible. Since there is no need to dig up sections of land, you save a whole lot of time. Trenches need not be dug and refilled. The traditional method uses up a lot of time simply to restore the repair site to its original condition, a situation that can be avoided completely with CIPP. While digging into the land can disrupt activity on ground level, there is another issue that is possible when using traditional plumbing repair methods. Unfortunately, your activity could interfere with utility lines running underground. Since CIPP technology installs new pipes and repairs broken ones without disrupting the ground, existing utilities have no risk of being damaged, which reduces your costs. Noise and air pollution are common problems when digging to repair and replace pipes. This pollution is caused by the many large digging machines that are brought to the site to form the trenches. With CIPP, the trenching never happens. None of these machines are required. This makes the technology perfect for urban or residential areas where noise and air pollution are considered public threats. When you compare it to traditional plumbing, trenchless repair is by far the most effective, cost-efficient, and durable method of repairing and replacing your pipes. It lasts for longer than normal piping, is completely resistant to corrosion, toxic decomposition, and other common pipe issues, and is easily one of the quickest methods in play today. Use CIPP trenchless technology today for a better tomorrow!